In its early years, the United States of America was primarily an agrarian nation. That all changed in the 1800s when the Industrial Revolution helped shift America to an industrial economy. By the Turn of the Century, America was the world’s economic and industrial juggernaut. No area represents this era better than the Lowell National Historic Park in Lowell, Massachusetts. Established in 1978, several buildings make up the national park and a visitor center helps link the various restored and unrestored sites from the 19th century. Now, this first issue of 2019 in the America the Beautiful series celebrates the area with this five-ounce silver Lowell National Historic Park coin. The America the Beautiful series has proven extremely popular since it began back in 2010. For those who have been collecting from the start, each release has provided a new and exciting way to discover and appreciate all that America has to offer. And the best way to collect these designs is as a whopping five-ounce, 90% silver coin in stunning Specimen condition! Measuring an incredible 76.2 mm in diameter, it’s nearly twice the size of an American Silver Eagle! Your coin will come with a smooth satin-like matte finish produced by a vapor blast process. In addition, has been graded by the Numismatic Guaranty Corporation (NGC) as being in stunning Specimen-70 (SP70) condition, a distinction that means your perfectly-graded coin will have ZERO imperfections – showing all features and fields exactly as the engraver and mint intended. In addition, NGC has certified this piece to be an Early Releases (ER) coin, a designation that means it was received by NGC or an NGC-approved depository within the first 30 days of the its release. The Lowell National Historic Park in Massachusetts is a perfect example of a coin that presents collectors with a scene of America’s history that would likely be overlooked otherwise. It features a depiction of one of Lowell’s “Mill Girls” – young women who were recruited to work in the mills and who lived in supervised, company-owned boarding houses. These women would go on to become one of the first voices for labor by advocating for better working conditions. 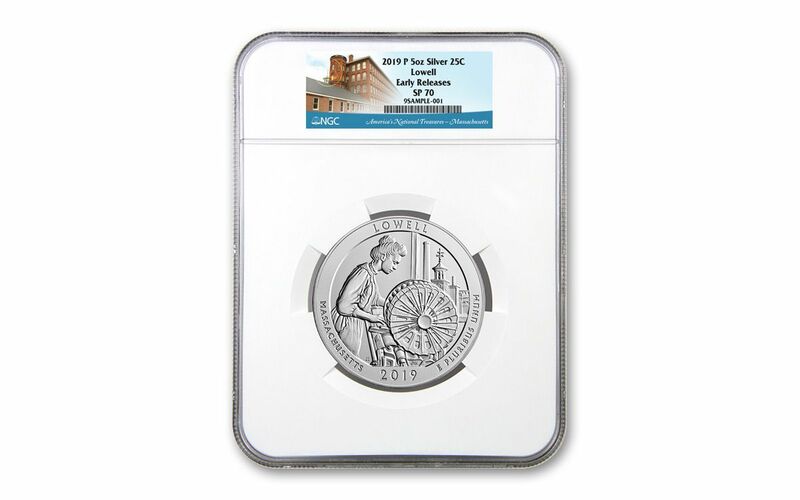 These 2019 Lowell National Historic Park Five Ounce Silver Specimen release is one of five America the Beautiful Coins that will be issued this year meaning it will be available only for so long. Add it to your collection before it’s too late! THE LATEST IN THE "AMERICA THE BEAUTIFUL" SERIES – This 2019 Five Ounce Lowell National Historic Park coin is the first issue of 2019 and the 46th overall in the America the Beautiful series, which began in 2010. STUNNING NATURAL SCENERY – The design features a Lowell Mill Girl working at a power loom. It also displays the words “"LOWELL," "MASSACHUSETTS," "2019" and "E PLURIBUS UNUM." A SERIES OF FIRSTS – Each coin in the America the Beautiful series was struck at the Philadelphia Mint from 99.9% fine silver. 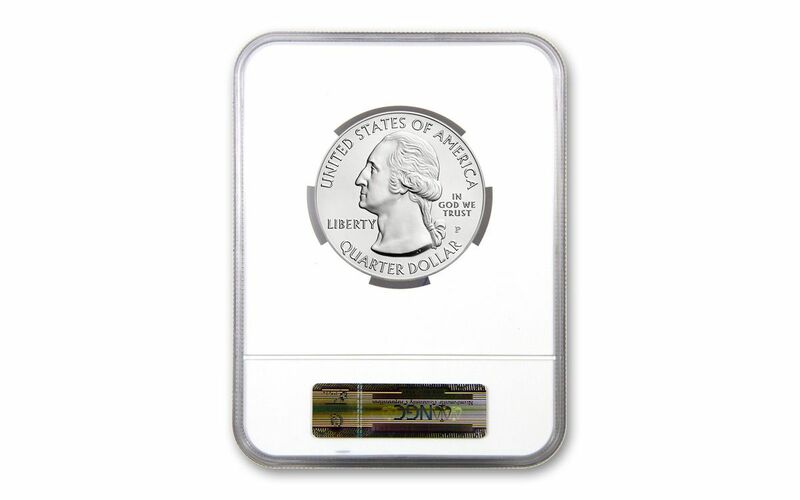 These are the largest ever quarter coins struck, measuring three inches in diameter. UNITED STATES LEGAL TENDER – Each America the Beautiful coin is twenty-five cents legal tender in the United States. GRADED IN PERFECT SPECIMEN CONDITION – Your coin has been graded by the Numismatic Guaranty Corporation (NGC) as being in stunning Specimen-70 (SP70) condition, a distinction that means your perfectly-graded coin will have ZERO imperfections – showing all features and fields exactly as the engraver and mint intended. KEY EARLY RELEASES CERTIFICATION – NGC has certified your coin to be an Early Releases (ER) coin, a designation that means it was received by NGC or an NGC-approved depository within the first 30 days of the its release.